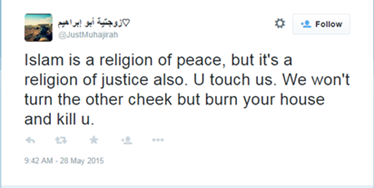 Twitter personality JustMuhajirah is a propagandist for ISIS. Purportedly a young woman living in ISIS-held territory in Syria, JustMuhajirah uses Twitter as a platform to broadcast her life under ISIS’s rule. When active on Twitter, JustMuhajirah posts tweets praising violent jihad and life in the Islamic State. In the past, she frequently propagated hate against kuffar (nonbelievers), purporting to do so in the name of Islam. JustMuhajirah also advocated a culture of death and martyrdom. 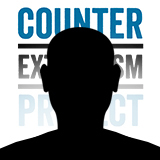 In addition to marketing life in ISIS territory, JustMuhajirah frequently quoted extremist ideologues, including deceased al-Qaeda founders Osama bin Laden and Sheikh Omar Abdel Rahman. 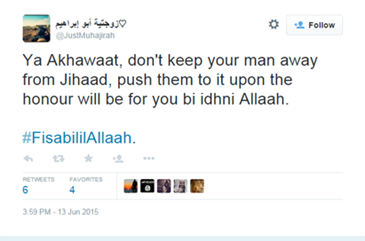 JustMuhajirah also tweeted about the supportive role women play in jihad. She called on women to “push” their men to carry out violent jihad in order to receive honor. JustMuhajirah’s tweets appear to be aimed at conveying the sense that women in ISIS lead a social and idyllic lifestyle. JustMuhajirah’s Twitter feed was populated with pictures of desserts and snacks. She also frequently referenced female friends and members of ISIS, particularly Oum Haarith.Oum Haarith, Twitter, accessed June 15, 2015, https://twitter.com/OumHaarith. The two accounts often alluded to each other as they shared in activities such as eating and baking.Oum Haarith, Twitter post, June 11, 2015, 7:10 a.m., https://twitter.com/OumHaarith/status/608954330142633984. While JustMuhajirah writes largely in English, she has occasionally posted in Dutch and referenced Holland, leading CEP to believe that Haarith may have immigrated to ISIS-held territory from Holland. On Twitter, Haarith claimed to operate out of ISIS-held Raqqa, Syria. @alMuhajiraah07 (suspected)Oum Haarith, Twitter post, June 21, 2015, 10:20 a.m., https://twitter.com/OumHaarith/status/612671338835243009. @JustMuhajirahOum Haarith, Twitter post, June 11, 2015, 4:10 a.m., https://twitter.com/OumHaarith/status/608954330142633984. 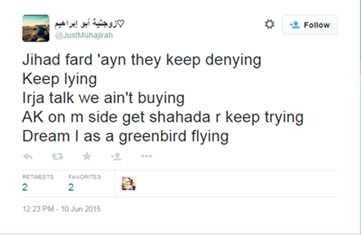 Twitter personality JustMuhajirah is a propagandist for ISIS. “Prepared to fight as a mujahid and afterwards die as a shaheed. #Shahada.”Just Muhajirah, Twitter post, June 8, 2015, 4:42 a.m., https://twitter.com/JustMuhajirah/status/607830021550575616. “If dawla [ISIS] wins w 30 from 800 you need to understand and see that the Kuffaar [nonbelievers] is in war with Allaah soebhanahoe wata'ala and not w us alone.”Just Muhajirah, Twitter post, June 1, 2015, 3:57 p.m., https://twitter.com/JustMuhajirah/status/605463280753233921. “‘Don't mourn a martyr who smiles.’ - Shaykh Osama Bin Laden رحمه الله”Just Muhajirah, Twitter post, May 31, 2015, 1:54 p.m., https://twitter.com/JustMuhajirah/status/605069827808591873. “Islam is a religion of peace, but it's a religion of justice also. U touch us. We won't turn the other cheek but burn your house and kill u.”Just Muhajirah, Twitter post, May 28, 2015, 9:42 a.m., https://twitter.com/JustMuhajirah/status/603919334562496512. “O Lions in every spot, exclaim Allaahoe Akbar victory is ours!”Just Muhajirah, Twitter post, May 26, 1:33 p.m., https://twitter.com/JustMuhajirah/status/603252590231556096. 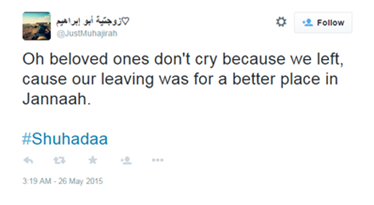 “Oh beloved ones don't cry because we left, cause our leaving was for a better place in Jannaah. #Shuhadaa”Just Muhajirah, Twitter post, May 26, 2015, 3:19 a.m., https://twitter.com/JustMuhajirah/status/603098225424367616. “Sickness is a way of purifying your soul. It’s well known that only pure souls will enter Jannah, so thank Allaah for purifying it.”Just Muhajirah, Twitter post, May 25, 2015, 12:11 p.m., https://twitter.com/JustMuhajirah/status/602869639190839296.